I love spaghetti squash. Love it! Sometimes, I’ll eat an entire one by myself with a little butter, garlic, and Parmesan. That said, I love when I can trick others into loving spaghetti squash too! Tonight, I got a six-year-old to eat three servings of this. Impressive, right?! Remove from microwave using hot pads and carefully cut in half. Allow to cool. Once squash is cool enough to handle, remove seeds and use a fork to “fluff”the meat of the squash. In medium sauce pan, melt 2 T. butter or olive oil. Whisk in 1/4 cup flour. Cook for 1-2 minutes to remove raw flour taste. Simmer sauce until thickened. Remove from heat and stir in 8 ounces sharp cheddar cheese. Place mixture into greased casserole dish. Sprinkle with Parmesan cheese and bake at 375* for 30-40 minutes, until bubbly. Cheese. Bacon. I’m not sure there is a better way to dress up spaghetti squash! 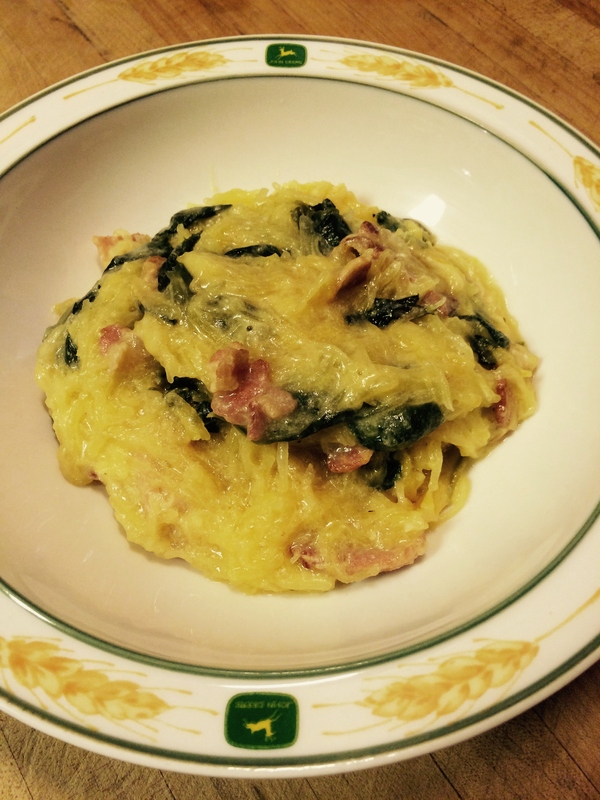 Posted in CasseroleTagged bacon, cheese, kid-friendly, low carb, recipe, spaghetti squash, spinachBookmark the permalink. Sounds good! Think I’ll fix this tomorrow evening. Awesome! It was really delicious!